Liver X receptor beta (LXR-β) is a member of the nuclear receptor family of transcription factors. LXR-β is encoded by the NR1H2 gene (nuclear receptor subfamily 1, group H, member 2). The liver X receptors (LXRs) were originally identified as orphan members of the nuclear receptor superfamily because their ligands were unknown. Like other receptors in the family, LXRs heterodimerize with retinoid X receptor and bind to specific response elements (LXREs) characterized by direct repeats separated by 4 nucleotides. 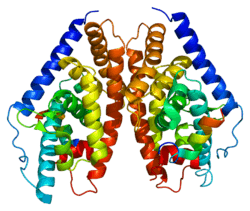 Two genes, alpha (LXRA) and beta, are known to encode LXR proteins. Crystal structure of human liver X receptor β(LXRβ) forming heterodimer with its partner retinoid X receptor α(RXRα) on its cognate element, an AGGTCA direct repeat spaced by 4 nt shows an extended X-shaped arrangement, with DNA- and ligand-binding domains crossed. The LXRβ core binds DNA via canonical contacts and auxiliary DNA contacts that enhance affinity for the response element. Liver X receptor beta has been shown to interact with NCOA6 and Retinoid X receptor alpha. ↑ "Drugs that physically interact with Oxysterols receptor LXR-beta view/edit references on wikidata". 1 2 "Entrez Gene: NR1H2 nuclear receptor subfamily 1, group H, member 2". ↑ Song C, Hiipakka RA, Kokontis JM, Liao S (Jun 1995). "Ubiquitous receptor: structures, immunocytochemical localization, and modulation of gene activation by receptors for retinoic acids and thyroid hormones". Annals of the New York Academy of Sciences. 761: 38–49. doi:10.1111/j.1749-6632.1995.tb31367.x. PMID 7625741. ↑ Lou X, Toresson G, Benod C, Suh JH, Philips KJ, Webb P, Gustafsson JA (Mar 2014). "Structure of the retinoid X receptor α-liver X receptor β (RXRα-LXRβ) heterodimer on DNA". Nature Structural & Molecular Biology. 21 (3): 277–81. doi:10.1038/nsmb.2778. PMID 24561505. ↑ Lee SK, Jung SY, Kim YS, Na SY, Lee YC, Lee JW (Feb 2001). "Two distinct nuclear receptor-interaction domains and CREB-binding protein-dependent transactivation function of activating signal cointegrator-2". Molecular Endocrinology. 15 (2): 241–54. doi:10.1210/me.15.2.241. PMID 11158331. ↑ Seol W, Choi HS, Moore DD (Jan 1995). "Isolation of proteins that interact specifically with the retinoid X receptor: two novel orphan receptors". Molecular Endocrinology. 9 (1): 72–85. doi:10.1210/mend.9.1.7760852. PMID 7760852. Seol W, Choi HS, Moore DD (Jan 1995). "Isolation of proteins that interact specifically with the retinoid X receptor: two novel orphan receptors". Molecular Endocrinology. 9 (1): 72–85. doi:10.1210/mend.9.1.7760852. PMID 7760852. Le Beau MM, Song C, Davis EM, Hiipakka RA, Kokontis JM, Liao S (Mar 1995). "Assignment of the human ubiquitous receptor gene (UNR) to 19q13.3 using fluorescence in situ hybridization". Genomics. 26 (1): 166–8. doi:10.1016/0888-7543(95)80100-Z. PMID 7782080. Shinar DM, Endo N, Rutledge SJ, Vogel R, Rodan GA, Schmidt A (Sep 1994). "NER, a new member of the gene family encoding the human steroid hormone nuclear receptor". Gene. 147 (2): 273–6. doi:10.1016/0378-1119(94)90080-9. PMID 7926814. Song C, Kokontis JM, Hiipakka RA, Liao S (Nov 1994). "Ubiquitous receptor: a receptor that modulates gene activation by retinoic acid and thyroid hormone receptors". Proceedings of the National Academy of Sciences of the United States of America. 91 (23): 10809–13. doi:10.1073/pnas.91.23.10809. PMC 45115 . PMID 7971966. Janowski BA, Grogan MJ, Jones SA, Wisely GB, Kliewer SA, Corey EJ, Mangelsdorf DJ (Jan 1999). "Structural requirements of ligands for the oxysterol liver X receptors LXRalpha and LXRbeta". Proceedings of the National Academy of Sciences of the United States of America. 96 (1): 266–71. doi:10.1073/pnas.96.1.266. PMC 15128 . PMID 9874807. Feltkamp D, Wiebel FF, Alberti S, Gustafsson JA (Apr 1999). "Identification of a novel DNA binding site for nuclear orphan receptor OR1". The Journal of Biological Chemistry. 274 (15): 10421–9. doi:10.1074/jbc.274.15.10421. PMID 10187832. Lee SK, Jung SY, Kim YS, Na SY, Lee YC, Lee JW (Feb 2001). "Two distinct nuclear receptor-interaction domains and CREB-binding protein-dependent transactivation function of activating signal cointegrator-2". Molecular Endocrinology. 15 (2): 241–54. doi:10.1210/me.15.2.241. PMID 11158331. Whitney KD, Watson MA, Goodwin B, Galardi CM, Maglich JM, Wilson JG, Willson TM, Collins JL, Kliewer SA (Nov 2001). "Liver X receptor (LXR) regulation of the LXRalpha gene in human macrophages". The Journal of Biological Chemistry. 276 (47): 43509–15. doi:10.1074/jbc.M106155200. PMID 11546778. Whitney KD, Watson MA, Collins JL, Benson WG, Stone TM, Numerick MJ, Tippin TK, Wilson JG, Winegar DA, Kliewer SA (Jun 2002). "Regulation of cholesterol homeostasis by the liver X receptors in the central nervous system". Molecular Endocrinology. 16 (6): 1378–85. doi:10.1210/me.16.6.1378. PMID 12040022. Brendel C, Schoonjans K, Botrugno OA, Treuter E, Auwerx J (Sep 2002). "The small heterodimer partner interacts with the liver X receptor alpha and represses its transcriptional activity". Molecular Endocrinology. 16 (9): 2065–76. doi:10.1210/me.2001-0194. PMID 12198243. Mo J, Fang SJ, Chen W, Blobe GC (Dec 2002). "Regulation of ALK-1 signaling by the nuclear receptor LXRbeta". The Journal of Biological Chemistry. 277 (52): 50788–94. doi:10.1074/jbc.M210376200. PMID 12393874. Williams S, Bledsoe RK, Collins JL, Boggs S, Lambert MH, Miller AB, Moore J, McKee DD, Moore L, Nichols J, Parks D, Watson M, Wisely B, Willson TM (Jul 2003). "X-ray crystal structure of the liver X receptor beta ligand binding domain: regulation by a histidine-tryptophan switch". The Journal of Biological Chemistry. 278 (29): 27138–43. doi:10.1074/jbc.M302260200. PMID 12736258. Färnegårdh M, Bonn T, Sun S, Ljunggren J, Ahola H, Wilhelmsson A, Gustafsson JA, Carlquist M (Oct 2003). "The three-dimensional structure of the liver X receptor beta reveals a flexible ligand-binding pocket that can accommodate fundamentally different ligands". The Journal of Biological Chemistry. 278 (40): 38821–8. doi:10.1074/jbc.M304842200. PMID 12819202. Fukuchi J, Song C, Ko AL, Liao S (Sep 2003). "Transcriptional regulation of farnesyl pyrophosphate synthase by liver X receptors". Steroids. 68 (7-8): 685–91. doi:10.1016/S0039-128X(03)00100-4. PMID 12957674. Hoerer S, Schmid A, Heckel A, Budzinski RM, Nar H (Dec 2003). "Crystal structure of the human liver X receptor beta ligand-binding domain in complex with a synthetic agonist". Journal of Molecular Biology. 334 (5): 853–61. doi:10.1016/j.jmb.2003.10.033. PMID 14643652. Walczak R, Joseph SB, Laffitte BA, Castrillo A, Pei L, Tontonoz P (Mar 2004). "Transcription of the vascular endothelial growth factor gene in macrophages is regulated by liver X receptors". The Journal of Biological Chemistry. 279 (11): 9905–11. doi:10.1074/jbc.M310587200. PMID 14699103.